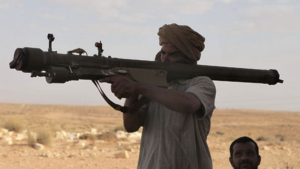 The Libyan MANPADS have reached terrorist groups including Al-Qaeda, Hamas, Boko Haram, the IRA and Syrian insurgents, as well as an array of autonomous non-state and terrorist actors in conflict zones across North, Central, East and West Africa, and the Middle East. In particular, the Tuareg militias in control of southwestern Libya are reported to be smuggling many back for use in their own campaigns for power in Mali, as well as for illicit weapons trading across Africa and the Middle East. 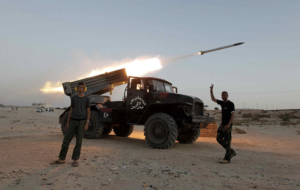 Although not as widely proliferated as the MANPADS, many Libyan armed groups continue to use various rocket systems looted from Qaddafi’s stockpiles. These include most commonly the Russian S-5, S-8 and S-13 rockets, launched from Soviet UB-16 and UB-32 MLRS (pictured at top) that have been adapted for deployment on pickup trucks. These rockets typically have a range of 1-4 km depending on type and launch, and carry conventional explosive warheads. 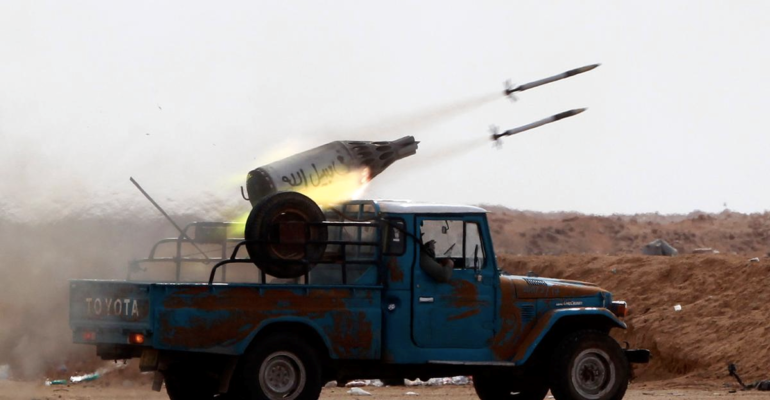 Additionally, militia and autonomous forces have used Soviet BM-21 Grad MLRS across Libya, while additionally exporting them to surrounding states including Mali and Chad. The Grad has a significantly larger range of 20-45 km depending on rockets armed with a variety of conventional or chemical warheads. Libya’s ballistic missile arsenal–prior to and after the collapse of the Qaddafi regime–consisted of around 80 Soviet-era Scud-B SRBMs acquired in the mid-1970s. These missiles went unused for decades. During the 2011 armed uprising, forces loyal to Qaddafi launched a Scud-B at rebel troops and the missile struck nowhere near its target, indicating the limited operational capability of Libya’s SRBM arsenal. Poorly maintained and with an inadequate military infrastructure for proper operation, Libya’s remaining Scud-Bs are likely unusable. Despite this, the precarious situation in Libya has increased the risk of missile proliferation to non-state actors in the area. This possibility sparked concern among U.S. State Department officials, who openly suggested targeting Libya’s Scud-B facilities during the country’s armed uprising. Small Arms Survey, “MANPADS,” http://www.smallarmssurvey.org/weapons-and-markets/products/manpads.html.